Chanukah Party at Chabad What does live music, giant menorahs, dreidels, and great food all have in common? All of these things were present at nothing other than the Chabad house at Rutgers’ celebration on Tuesday, December 8, 2015! 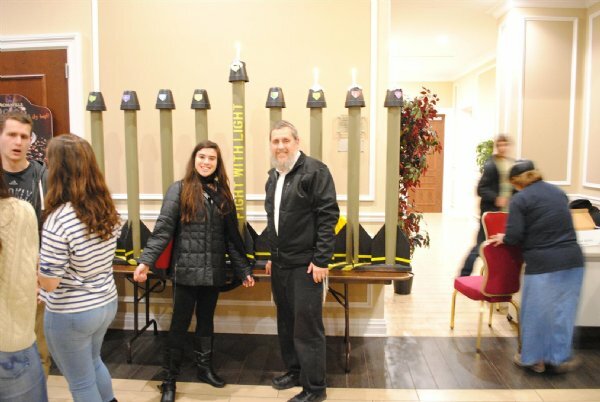 Even though Chabad holds a weekly Tuesday night celebration throughout each and every Rutgers University semester, this party was special in particular because it captured the spirit of Chanukah. Signs decorating the doors and walls of the building wished guests a happy Chanukah in colored words of bright azure and ruby red. Even standing from outside, one could hear live music fill the ballrooms and opening gates with the happiness of a holiday spirit. By the evening’s climax, students were packed into the building. Despite all these attractions, one giant menorah, approximately ten feet, stood proudly in the dining hall. Before leaving, the entire community of Chabad was invited to take a picture in front of the menorah. Throughout the rest of the night, other groups of students rotated taking pictures with their close friends to remember the occasion, including girls from challah baking, as well as fraternity members of AEPi, the Jewish fraternity on campus. 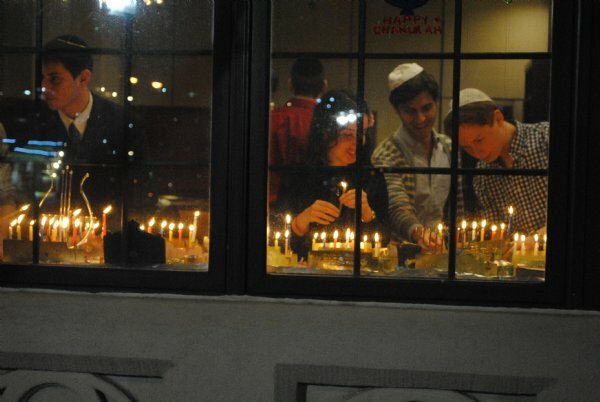 Beyond these festivities, Chanukah candle lighting took place in the synagogue, located right across from the dining hall. 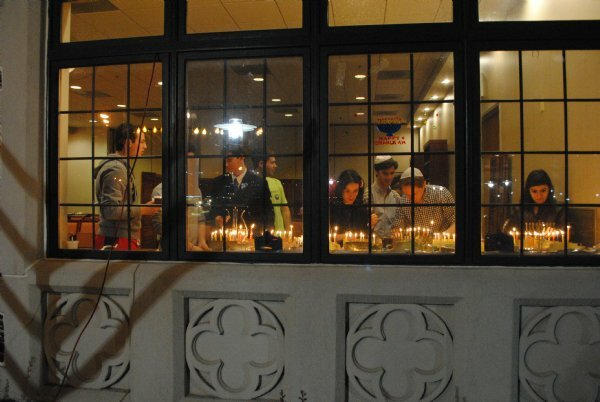 Flocks of students visited the dozens of small menorahs displayed by the Chabad window to light candles and say appropriate prayers. Moreover, for those unfamiliar with the proper Hebrew blessing to say, their fellow classmates were quick to help. Not only did these more experienced students actively teach others the correct prayers, but also lead successive groups of students in singing Chanukah songs and prayers. Walking through the corridors and halls, one could easily see students happily chattering and enjoying their time. Even with impending finals the following week, and plenty of students with bags under their eyes, the event’s organizers were grateful for such a fantastic turnout of students. “This is a great break,” one anonymous student commented, “We have so much studying and pressure so it’s nice to be able to celebrate Chanukah with finals right around the corner.” Interestingly, this sense of appreciation is not unique to the students who attended this particular Chanukah festival at Chabad, but rather is evinced at various event throughout the year. 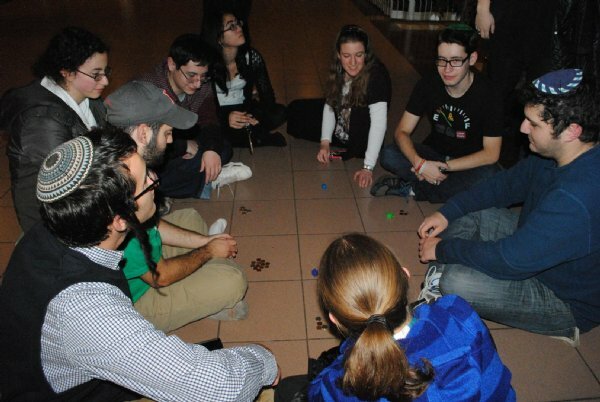 Granted, this time of year is busier with preparation for upcoming tests consuming students’ schedules, but the community of Jewish students who attend Chabad events almost always that the various festivities from holiday festivals to community service activities contribute to their development and sense of belonging in their college careers. In the future Chabad looks forward to holding more events in celebration of upcoming Jewish holidays as well as holding even greater Chanukah events next year. For more information about upcoming holiday celebrations please contact Chabad House at Rutgers, and visit us on the web at www.chabadrutgers.com, www.chabadnj.org, or call 732-296-1800.